Imagine proposing in a dirty apartment or restaurant. Juvenile male golden-collared manakins who received extra testosterone were stimulated to clean up their display area before performing for females, according to research at the Smithsonian Tropical Research Institute (STRI) in Panama. The research team's results, published in the journal Animal Behavior, showed that tidiness during courtship is influenced, but not determined exclusively, by hormones. Adult male golden-collared manakins (Manacus vitellinus) show off their bright-yellow throat and beard to attract the attention of females. They strut their stuff in groups called leks in a defined display area on the forest floor, which they carefully clean by removing dead leaves and foliage that obstruct the female's view. During the courtship display, males perform complex acrobatic moves, leaping from one sapling to another, while making conspicuous "snapping" sounds by forcefully beating their wings together above their heads. To see how far adult males go to keep the display area clean, researchers added weights to the undersides of some of the leaves in the display area to make them heavier. Some males were so motivated to clean up that they flew carrying leaves weighing as much as their own body. Only adult males display. 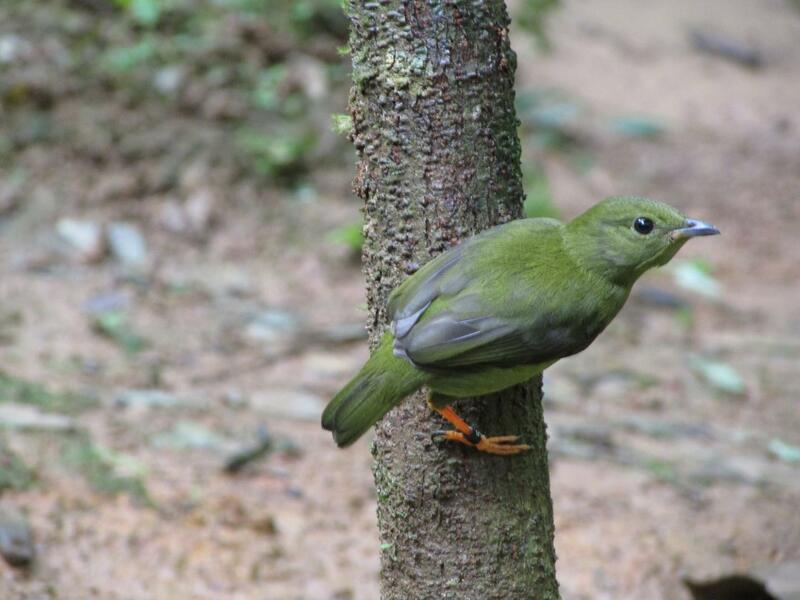 "We wanted to know if hormones influenced the manakins' drive to clean up their mating display area, so we treated juvenile males and females with testosterone," said Ioana Chiver, post-doctoral fellow at STRI. "Testosterone-treated young males really got into cleaning up the display court. They removed significantly more leaves than untreated males and even pulled up small tree seedlings." "Adult males come up with original ways to remove the leaves from the display area," Chiver said. "We think of younger animals as being more innovative, but here we see that hormones may be playing a role in motivating the birds to persistently seek new ways to court their mates." "Even when treated with testosterone, females were not motivated to clean the male's display area, although they did become more aggressive and show some other male display behaviors," said Barney Schlinger, co-author and professor at UCLA. "That tells us that hormones alone are not enough: testosterone is activating specific neural circuits in males. Females either do not have these circuits, or they are insensitive to testosterone." "I like the way this study combines ingenious field experiments with the living birds and work in the lab–something that is not often done, but is easy to do at the Smithsonian in Panama," said Mary Jane West-Eberhard, staff scientist emerita at STRI. "Their results remind us that the way an animal behaves and the way its genes are expressed — often powerfully influenced by hormones — depend on the animal itself, whether it is male or female, and how it formed during development at the time when the hormones and genes act. We should be wary of often simplistic beliefs that sexual behavior is determined by genes or hormones alone." The authors thanked the Panama Rainforest Discovery Center for the use of their aviary and Panama's Ministry of the Environment for permits. The study was funded by the U.S. National Science Foundation.